It has been a decent year for property it is fair to say. Yes, there have been better but equally there have been worse. 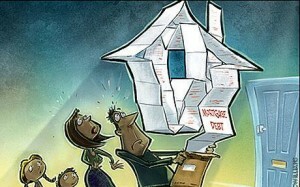 A new problem awaits in 2013 though and it has very little to do with property taxes or a lack of mortgage lending. Yes, they will have their own impact on the market but the biggest worry at the moment has to be in relation to the number of people who are falling into arrears on their mortgages. Figures released yesterday show that 86,000 or 11% of homeloans in the country are now more than 90 days in arrears. That figure has risen by 5,000 from the previous quarter and with Budget cuts and the new property tax on the way it doesn’t look like easing any time soon. To top matters off the government will shortly be removing a legal loophole, which up until now had halted banks from carrying out mass repossessions of properties. The government has given a commitment to the Troika that this will be sorted by March and yesterday Tanaiste Eamon Gilmore reaffirmed that vow when he said it was very much on the agenda for the first half of the year. First in the firing line of banks in terms of repossessions are buy-to-let investors who are in arrears. There are more than 26,000 of these, accounting for 17.9% of the overall total. Recently a home was repossessed in the North East of the country where a mortgage of around €200,000 was owed. That same property went on the market this week for just €40,000 as the bank seeks to recoup some of its losses. That shows that banks are becoming more ruthless as they desperately seek finance to help steady their own balance sheets. Up until now repossessions have been few and far between but banks will get more ruthless, particularly when a change in legislation allows them to be more heavy-handed in their approach. The mortgage arrears problem is one that is not going away but unfortunately there has been little done to sort it out up until now. As well as those in long-term arrears a further 81,683 residential mortgage accounts have also been restructured up to the end of September. With people’s finances constantly dwindling though, the hope of these people ever getting back to ‘normal’ repayments seems unlikely and if ECB interest rates were to rise next year the problem would only get worse. The government can’t keep burying its head in the sand in relation to this problem and hope it goes away. If it is let linger, the problem will only grow worse with banks likely to be even more keen to carry out repossessions if and when property prices start to rise again. It is hard to see it at the moment, even though personal insolvency legislation is on its way. Yes, 2012 hasn’t been a bad year for property but only for those in a position to move. For the thousands in arrears at present, many can only dream of being able to participate in the market again and move to a place more suited to their current situation. In reply to Alan above – there is no way the banks have a €200K mortage down on their balance sheet as a liablity. They have it as an asset on the other side of the balance sheet! They may have a bad debt provision for part of the €200,000 but I doubt it reflects the reality of the full potential loss. The reason that banks are putting defaulting mortgage holders on payment plans such as interest only, or just accepting say €200 per month when it should be €1,000 per month, is so they don’t have to crystallise the loss on their balance sheet by repossessing the property and selling it at current market value. The banks are probably secretly delighted about the current legal loophole which is preventing them repossessing property. Perversely the best thing for some mortgage holders would be for the banks to have the power to repossess. At the moment there is no incentive for banks to do a deal with mortage holders to stay in their homes and actually write off some of their arrears. If they thought they could get a write off in return for a lump sum down payment on the arrears I bet a fair percentage of the defaulters could come up with a decent “cheque” from somewhere, like cashing in a separate investment that they have in mind for their pension etc. It is frequently said that the “market is fake” but this is only because the people fake, victims of their own propaganda. Forgiving debts encourages more of the same, broken promises, deluded expectation, the failed hope to have the cake and eat it, fleeing from reality as if it stood no chance to catch up. The Banks Created the situation in the first place,and will no doubt have to solve the the problem by whatever means at their disposal. We knew when we signed on the dotted line what we were signing up to. This will be resolved by either of two solutions, pay up or repossession. We all know of the hardship that has befallen many people,the loss of jobs and subsequent income,the almost penal taxation system which only compounds their plight. Where people have negative equity/arrears and have suffered the full brunt of our misadventure,in particular where children are involved,legislation or government involvement,all be it at local level should be provided to ensure such victims are not on the side of the road.There are many other social aspects that should be considered, but alas no listening ears. Buy to let, Second Homes,and all other investment type properties,whatever the motivation for involvement in the first place,will have to sink or swim. For those who don’t understand why a bank would swap a liability of 200,000 for 40,000 cash a simple answer is improving their capitalisation ratio … i.e. On the Balance Sheet: Liabilities down 200k, Cash on Hand up 40k this goes a way to sticking to strict capatlisation rules. If this new to you then perhaps you should become more clued into the rules …. I only have a basic knowledge but can savvy the bankers methodoligy. Trackers are crucifying them so they need to eliminate them from the market. If 26,000 speculators got themselves into debt … then hey … Paddy Powers don’t give you your money back! Keyboard sticky so excuse the sticatto !!! If we see families being evicted leading to homelessness – then it will be time to stand up and be counted through mass demonstration. What point is there living in a society where children may be evicted from their homes leading to insecurity and instability in their lives. If children or old people are evicted – then lets all support them and stand behind them and say no to these damned bankers. There is a difference between a investment property and a family home. Shame on us if one child is evicted from their home.I hope it does not come to this. If it does – then lets get out there. The “Huffing & Puffing” and General Incompetence of the present Irish Government is “Beyond Belief”. The Suits in Brussels & Frankfurt must be laughing their heads off at the Irish People for putting up with such utter stupidity. In Germany they have leases on rented properties that can pass from one family member to another. Something similar in this housing market should be considered this would also be worthwhile to look at. I have had 2 properties (1 home and 1 rented) and both in negative equity and then just to top it all off lost my job, had a car accident and was left in rehabilitation for 6 months. Now after 2 years of okay health and working extremely hard. I’ve managed to sell one property at a loss, pay bank back and also started to reduce negative equity in 2 n d home. Its hard work and it hasn’t been easy but I’m proud and I will pay my debts as it’s my own mess and I have to take responsibility for this. I think it’s not so much the money, it’s more that we keep mentally strong as a nation and fight every day. The fact of the matter is the idiots we have for politicians representing us don’t care about us it’s all one big game. We need to take control for ourselves in every way we can everyday. Whatever solution is coming from the government, I don’t believe it will benefit us in the long run. The current market is fake, it does not reflect the reality. Some of these properties must come onto the market. The current market if full of low grade properties which are forced sales from investors, nothing else is being put up for sale. Typical of every Irish Government regardless of who is in office, Reactive instead of Pro Active. Maybe we should keep the Troike and sack the present Dail? I sincerely hope the above is a typo, if the mortgage is active why throw the baby out with the bath water? Extend the mortgage terms to 100 years if necessary because flooding the market will serve no useful purpose. The Government must tell the people what the clear plan is -uncertainty leads to a very unhealthy position.